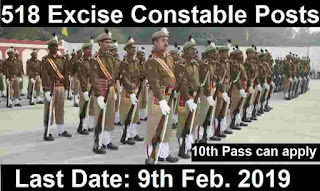 JSSC Recruitment department is looking to filled up 518 vacant positions of Excise Constable Officer posts. An official notification is out from JSSC Recruitment department related to this recruitment process. They explained who criteria as well other conditions in that PDF file. We also took this information from that file only and shared with you readers. So all the rights of the information which we shared in this article goes to that PDF file only. We also shared the official PDF file link under IMPORTANT LINK section at the last of this article. This is a great opportunity to grab a 10th pass Government jobs in India on regular basis. Those who are looking for the Government jobs in Jharkhand state can apply for this JSSC Recruitment process 2019. More information which we have taken from that PDF file shared below in this article so read the whole article carefully before applying online. Pay Band: Rs.5200 – Rs.20, 200+ Grade Pay 1900 per Month. Educational Conditions: All Indian fresher candidates who have passed in their 10th class examination from a well-recognized education board of India can apply for this JSSC Recruitment 2019. Can apply for these Government jobs in Jharkhand. Paying Method: You can choose Internet Banking, Debit Card, Credit card for the payment of the application fee. These are the only way for the payment of the application fee related to this JSSC Recruitment 2019. 26TH Dec. 2018 is the Starting Date. 9th Feb. 2018 is the Last Date to apply.